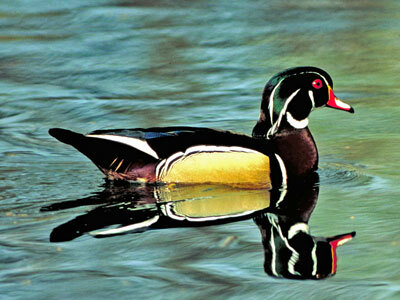 The wood-duck is arguably the most beautiful duck that is found in the Chesapeake Bay watershed. Containing thousands of acres of cypress swamps, flooded pine forests, and wooded streams, the estuary is an important breeding ground and wintering area for wood ducks. During the breeding season, wood ducks move up rivers and creeks into remote swamps where they nest in dead trees. During winter, wood ducks move downstream, occasionally gathering with mallards, black ducks, pintails, teal, Canada geese, and other waterfowl.